Ornamental Tobacco (Nicotiana): growing, planting, caring. 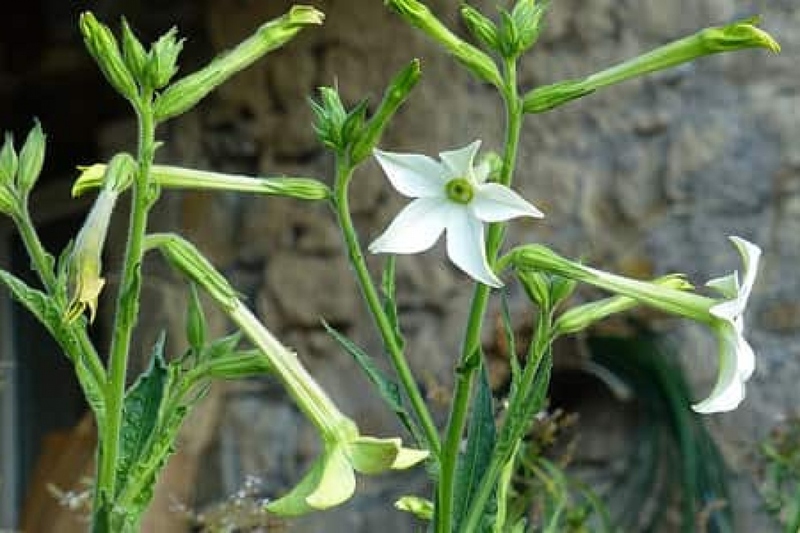 Tobacco is commonly used as an ornamental plant for its long cornflower flowers - especially since it repels mosquitoes! The varieties of tobacco used in ornamental are not the same as those for consumption! Ornamental tobacco is generally used as an annual plant, even if some species are perennial, because it can not stand frost. The flowers in long tubes are smelly, and have the peculiarity of opening only at the end of the day. Usually white, there are many cultivars that offer all shades - except perhaps blue. Beware, like many solanaceous plants, tobacco is toxic and should not be ingested. NB Tobacco manure rejects biting insects ... and also people with a sensitive nose. Plant in spring in rich, well-drained soil, in sun or partial shade. If necessary, add compost or manure to the top of the soil. Soak the cups at least 30 minutes before planting. You can plant your tobacco in the ground, provided you find a situation sheltered from cold winds. Note that tobacco freezes between 0 and -5 ° C. In pots, choose a container at least 30 cm in diameter. Lay a layer of gravel or clay balls at the bottom and fill the pot with potting soil or ripe compost and loam. In all cases, water just after planting. Water your potted tobacco regularly, but not excessively - do not wet the foliage, and do not fill the cup. Tobacco is demanding, so in pot you can boost it by giving it some liquid fertilizer - without excess. A reasonable pace is every two weeks in times of growth and during flowering. If you fear frosts in your area, bring your potted inside tobacco as early as October. Place it in a cold greenhouse or an unheated, bright room. This is not essential, but just before flowering it is useful to pinch the stems. This consists in shortening them to the highest floral bud, in order to keep a compact port to your tobacco. Every 3 years, you can repot your tobacco in a new container. For that, provide him with a slightly larger container filled with potting soil or compost and garden soil on a bed of gravel. Soak the root ball 30 minutes before moving it. If you do not have a larger pot, just scrape the topsoil and replace it with ripe compost.